I am very happy you found your way to my little place in the digital word! 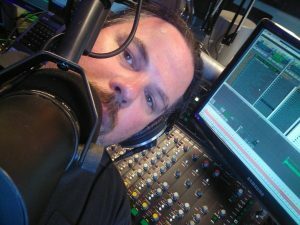 I’m a radio enthousiast for almost 30 years! Started as a volenteer in hospital radio, and worked (and still work) at several local radiostations. What can I say. I just LOVE MUSIC. Click Your Radio is my way of sharing my love for music with everyone who is willing to listen! For me, this is a hobby that I do besides a normal day-job and family life. For me it’s not about making a ton of money, but just sharing my love for music, because music is the essential fuel for the soul. It can comfort you, make you melancholy or make you want to party all night long. Click Your Radio offers 7 different streams you can choose from. Below you will find a short discription of every channel with 2 bottons that will open a webplayer for the channel you choose. One botton wil open a 128kbs mp3 stream, the other contains a 64kbs AAC stream. Every channel has his own dedicated page which wil open if you click on the channel of your choice in the menu at the top of the page. On this page you can find the song now played on the channel of your choice, and here you can make a request of your favorite song. To prevent that the same song gets played over and over again, there are some rules. Once you made a request, you can’t make another for an hour. Once you requested a song, you can’t request it for another 24 hours. In short, if you made a request, you must wait an hour before you can make another one, and then you have to go for a different song. Every channel in the top bar shows a dropdown menu, with 4 streams to choose from. 2 streams (one 128kbs mp3 and one 64kbs aac) are more secure, because they use a https stream.They are marked with (s). Though more secure, they might not work on every device, so the same streams are offered as a normal http stream. On the right side you wil find quickbuttons for almost all players : I-Tunes, Realplayer, Webplayer,Windows Media Player and Winamp alongside parters and radiodirectories where we can be found. This channel playes a variety of dutch and flemmisch songs and comedy. Some might be moderen, some might be 100 years old. This channel also includes a high amount dutch “cabaret”, wich is a tipicaly dutch tradition with its roots in de comedyclubs from Paris and Berlin at the start of the last century, and has grown into a typical form of comedy from the lowlands. Stand Up comedy and song are the main component of this genre, and you will find both on this channel. I hope to reach dutch communities in Canada with this channel. Here we celebrate the start of popular music. You will fing music from the 40s to the 70s. The age were popular music saw it’s birth and march into puberty. This is the age of Elvis Presley. The Beatles and John Travolta. The years of Little Richard, The Supremes and Barry White. All can be found on this channel; Rock ’n Roll, Barbershop, Disco, Merseybeat, Early Rock, Rythm&Blues, Soul, Funk and more, lots more. Do you remember these 2 decade’s? It were the years I grew up to become an adult. It has been stated that the music from your adolecent years are the songs you will remember most. It is this period for me. It were the years I followed every hitlist I could lay my hands on and it has found it’s way here. From the romatics in the early eighties to the eurohouse and dance from the nineties. Every song a part of the hitsuccesses of these two decades. Classic Rock and Blues. It says it all. Or does it. Of course loads of classic rock and blues, but also singer-songwriters, Americana, Prog Rock, AOR and loads and loads more. Maybe the most diverse channel of all seven. Certainly a place for the listener with a taste of adventure! This one you want to choose if you want to make your head hurt, and your neck sore. Every aspect of metal will be played on this channel. Heavy, Death, Doom, Power, Symphonic, Black, Thrash, Folk, Gothic, Groove, New, Hair, Progessive, Vinking, Speed and New Wave Of Britisch Heavy Metal. In this already divers mix I’ll throw in the best and most energetic Punk I can find. This channel is a personal fascination. I love christmas music. Why? There is no other genre of music dedicated for one timeframe in the year. And none so elaborate. Every genre has it’s one december complement of songs, and it’s growing every year. From the classics from Bing Crosby to the modern songs of Coldplay. Almost every artist has it own Christmas songbook. This channel collects them all. So, Thank you for being here and make a choice to your liking!